Education is the socialization period of a human being. Thus, the most important element of social development is education. Quality became the most ascending concept in the developed world towards the end of the 20th century. It will also continue to grow in the 21st century. The Industrial Revolution has systematized the concept of quality. That quality is perceived as a system that has developed the human brain and caused to increase the number of people who have systematical logic producing knowledge from the work, production and service that they come across in every day life. A human being having systematical logic is an individual of quality. Quality makes the work done by a person more qualified. For Emerson, “Thought is the mother of each activity .” Behaviors and reactions are the results of thoughts. The best and healthiest way of having a quality society is quality in education. In fact, today, quality approach takes place in each vision of modern and ideal educational foundation. However, at IRMAK School, quality is not just a vision, but a solid action even beyond the vision. Because IRMAK was founded with the aim of creating a “Qualified Education Institution”, one of the fundemental aims of our Quality Education Institution is to bring up quality citizens who are aware of their skills and responsibilities, and who are productive, creative, happy, and who can solve problems. Quality in the physical environment. Quality in the management and education system. Quality in the school's academic environment. Quality in the founders' ideas. Finally it can be summarized as quality in an educated student's thoughts. It has been the aim of IRMAK to form high quality education and management standards and to turn these into better standards day by day by renewing them in an objective environment that measures and evaluates the system, by organising seminars to educate and instruct educators and founders. These are some of the solid examples of the studies for development. Later on, the idea that these studies should be suitable for TS_ISO 9000 standards came up. The Fundamental Education Policy is legally defined by the Ministry of Education; therefore, it was decided to document management and education activities for the TS – ISO 9002 accreditation program. After IRMAK was awarded the ISO 9002 certificate in 1997; it started the application processes for the ISO 9001-2000 version, which also covered the High School at Irmak. The goal of applying the system is to transfer quality consciousness to the manager, teacher, parent and student. IRMAK education system is not only responsible for the parent, but also for Turkish society and the world. Learning is continuously developing by renewing itself together with the collabortaion of the parent, the teacher, and the student. At IRMAK, high quality education standards have been defined. Therefore, longer education hours are applied and significant and meaningful homework is given. 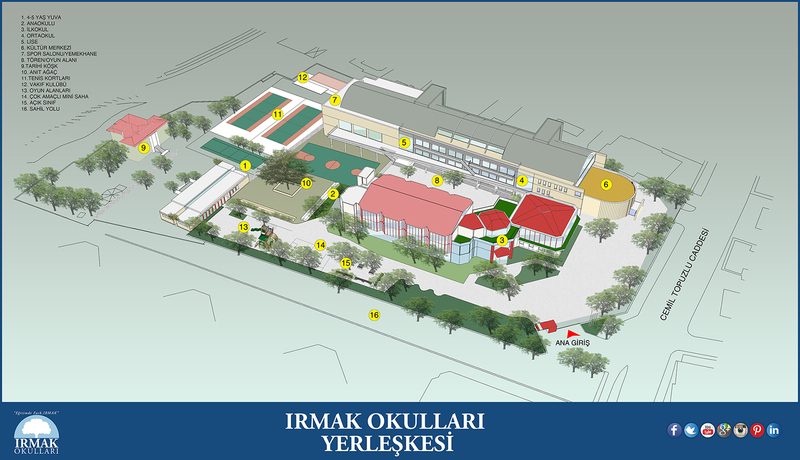 At IRMAK, there is a student – centered education system giving importance to the arts, sports, and creative thinking. IRMAK believes that it contributes to forming a quality society by raising powerful, happy and qualified people. Irmak Primary School had previously held the certificate of ISO 9002 that had been received on November 25, 1997 . Because of the changes in standards and to include the high school in the system, it has been required to change certificates. Therefore, in June 2003, a calendar for the things to be done was drawn up and a team for the project was enlisted with the running of the plan. The team for the project started the studies of the quality systems with the guidance of adviser Mr. Gökhan Us in September. Existing procedures have been unified; new procedures which are necessary for the new standards have been formed. The changes in education have been accepted as a different procedure; however, it has been considered that too many studies have been done; thus, it was decided to form a new book. The definitions of duties have been renewed; some of the instructions have been taken out while some of those have been added to the system. All of these take place in the procedure. In addition to these, 154 forms used frequently in the system have been created. All of these books and forms have been formed in the computer system. Furthermore, it is provided to the readers so that they can reach the system by using a password. Mr. Us educated the voluntary teachers and staff in addition to the project team in the branch of Quality Inner Investigation Education. As a result, 20 out of 20 participants were successful. December 9-11, 2003 it was internally evaluated. Our quality system was externally evaluated by the certification firm, DQS on December 17–18, 2003 and was proved worthy to be awarded the certificate of ISO 9001: 2000 without any mistakes. This page was created on 8.6.2017 14:05:25 and has been visited 2161 times.